Ca 1880, persimmon, pine, Kyang Ki Do Province. Rare finding after war; exceptional construction complimented by wood and brass fittings; certified. 73½” h. 39¼” w. 23½” d.
This chest comes in three pieces and was used to store a military officer’s uniforms and personal belongings. 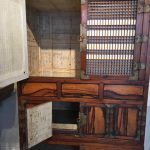 The top section consists of three drawers at the top, a big storage compartment with latticed doors below for bulky uniforms, and a storage compartment behind swivel doors for smaller personal items. The next section is a narrow storage compartment behind a pair of doors. These two sections sit on a long drawer above a recessed apron with gourd-shape decorative piece at each end. These sections are lined with rice paper and textbook pages to protect against extreme hot damp summers known to exist in Korea. The front panels are made of the highly decorative persimmon wood, using its spectacular dark grain figuration against a light-colored background to produce balanced mirror images that resemble paintings. Beautiful stylized ruyi and swallow-tail brass fittings compliment the persimmon front panels. 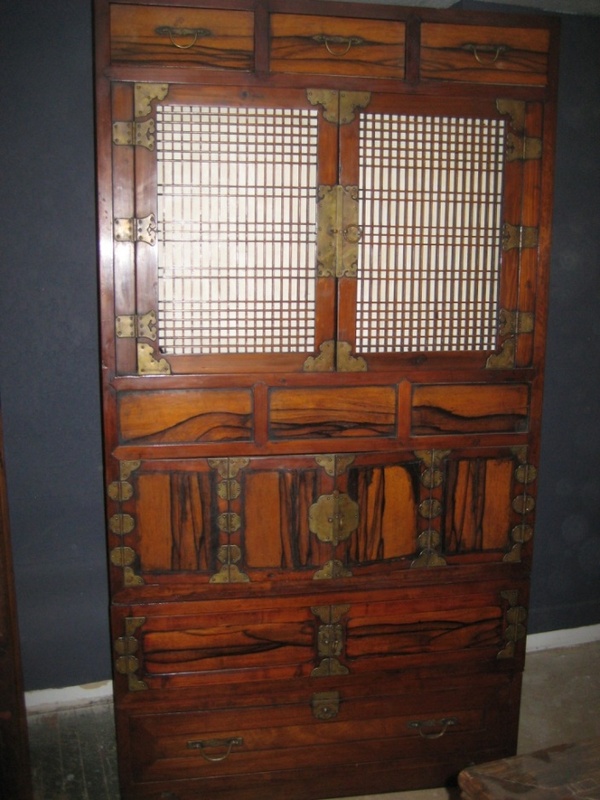 The side panels of the chest are made of pine. A military officer’s chest as spectacularly constructed as this one must have been made for a general-officer. 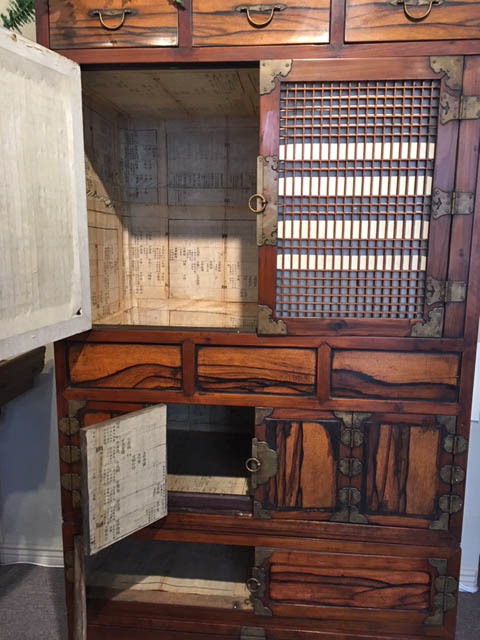 This chest was certified in the 1900s by a Professor of Korean History and Antiquity as very rare, as according to him, a uniform chest of this caliber, made for a high-ranking military officer, is not known to have survived in Korea.